Including a candy buffet or dessert table at birthday parties and weddings has become the standard. It makes for a stunning statement piece in the room and gives your guests somewhere to go while you get the rest of the party started. Once you start planning it, however, you realize how expensive it can be when you factor in all of the candy you want. It is possible to make your own candy buffet and to stay within budget, it just takes a little extra planning and know-how. And that’s where we come in. Today, we’re giving you some helpful tips on how to plan stunning candy buffets or dessert table when you’re on a tight budget. The picture above is a perfect execution of a budget-friendly candy buffet. If you’re looking to save money, you probably don’t want to fill up one of your biggest jars with a candy like M&M’s or Sixlets. They’re too small and you’ll need tons of them to make the jars look full. Michelle from Michelle’s Party Plan It used big gumballs and big gummy candies to take up more space in the big jars. If you’re looking for unwrapped, colored bulk candy wholesale, try Jordan Almonds instead of M&M’s. The bigger candy-coated candy takes up more space in the jar and you get a similar effect as the M&M’s. Plus, Jordan almonds are $32 for 5-lbs, whereas M&M’s are $58 per 5-lbs. 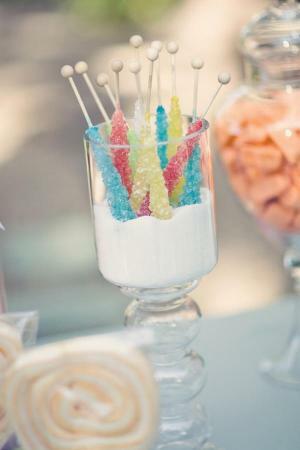 You can also fill large jars with tall candy like Pixie Stix, Twizzlers, or rock candy. Just make sure that there’s something decorative at the bottom so the candy is easy to reach for guests. The picture above is a great example of stacking tall candy so that it’s reachable for your guests. The entertainer here used what looks like white sugar (very clever!) to fill the jar up. Conversely, fill small jars with the smaller or more expensive candy. Your guests won’t take as much candy from the small jars…if they’re respectable, that is. Expand your candy buffet to include other desserts or snacks and you’ll save more money. You can buy some pretzels from the grocery store and dip them in chocolate, if you’re willing to spend some extra time. You can also make a big batch of something (popcorn, chocolate covered pretzels, donut holes) and split it up into individual servings, like the picture above. The person who hosted this baby shower did a great job making this buffet look amazing, but probably didn’t spend much. She made a stunning backdrop using paper plates, rationed out popcorn and pudding, and even divided bubble bath into small individual gift jars. A little innovation goes along way for dessert buffets. Don’t discount the dollar store when it comes to candy jars and decor. When you’re on a budget and planning a candy buffet, the dollar store should be your first destination. Places like the Dollar Tree have tons of neutral and simple decor; and if they don’t have your preferred color, paint it! 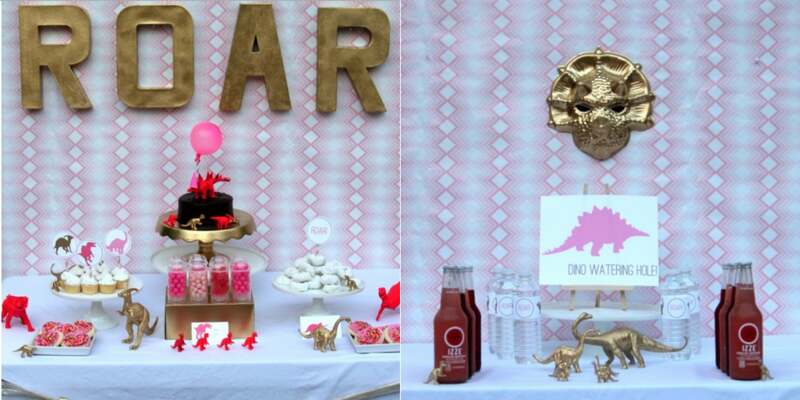 The party above features plastic dinosaur toys, a dinosaur mask, and wooden block letters all spray painted gold to match the girly, glam version of a dinosaur-themed party. If you’re looking to fill up blank space on your table, consider making a DIY centerpiece like a big framed picture of the birthday girl or boy or a floral arrangement. If you’re skipping the centerpiece, focus your attention on making a killer backdrop. It can be as simple as taping some balloons to the wall or tying some fabric scraps together to match your color scheme. 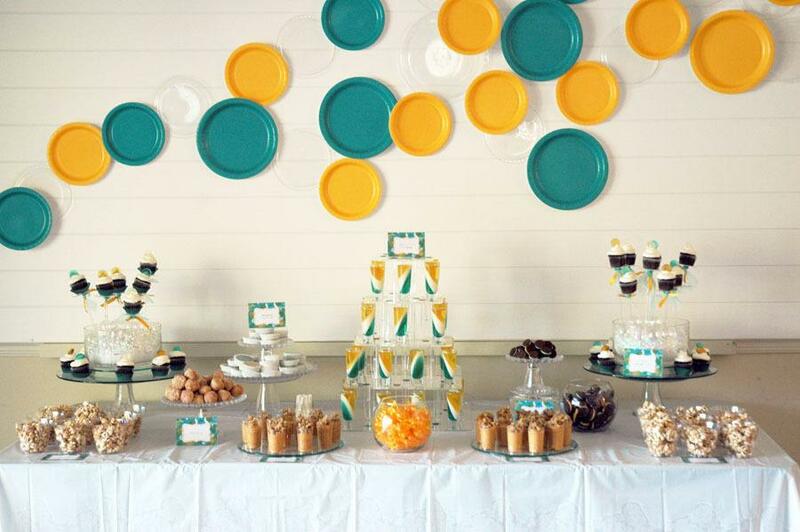 If you don’t have a backdrop, your candy buffet will look empty and might “disappear” against the wall. Your best bet if you don’t have it in your budget to make a backdrop? Place your buffet in front of a window or an accent wall. The Internet has tons of free resources for parties and weddings, so don’t waste your time or money making your own labels and decorations. There are tons of free printables on party planning sites like Catch My Party, I Heart Naptime, and tons of other blogs. All you need to do is download the printables, customize the labels to what you have on your dessert table, and your candy buffet is guaranteed to pack a big punch. Additionally, there are tons of budget-friendly DIY projects out there for parties. Everything from glitter garlands to backdrops to customized treat bags. 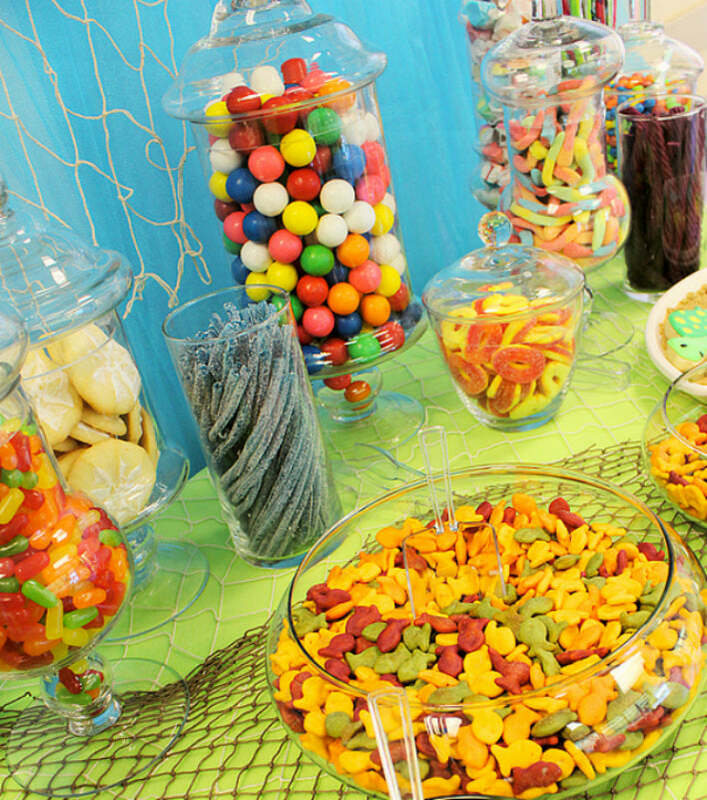 Have you recently thrown a budget party with a candy buffet? We’d love to hear some of your own tips and experiences! I’ve recently started an event planning business. Thank you for the article, it’s been very helpful. I’m putting one together for my upcoming wedding. I’m using multiple pieces of Dollar Tree poster board that I covered in wrapping paper from Ikea to hang behind my candy buffet as a backdrop. I’ve made a 40″x60″ backdrop for only $12! 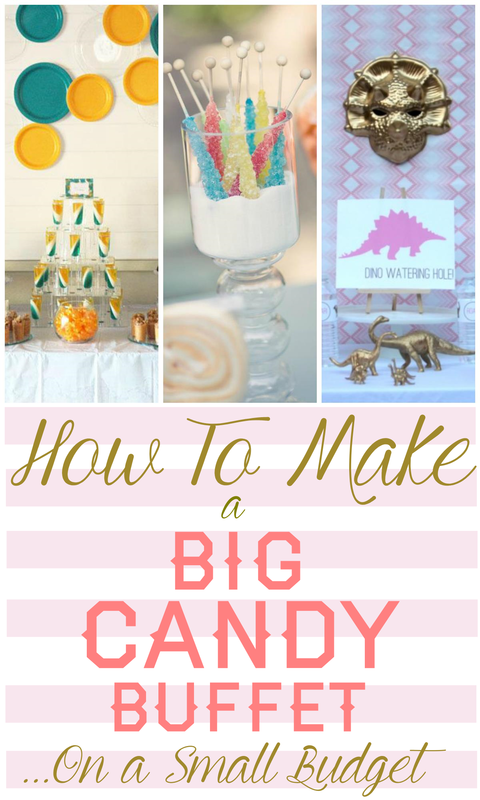 Thanks for going over these tips for making a big candy buffet. I’m glad that you mentioned that it’s possible to make your own centerpiece, or at least make sure you have a nice backdrop. It seems like a great way to tie in the candy with a theme. I’m interested to see some other themes that people have used and how they used the candy to fit in with the theme.